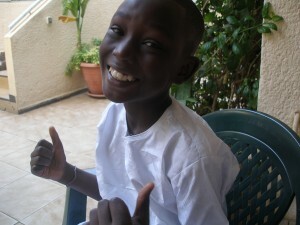 Last Monday was Tabaski, one of the biggest Muslim holidays! Throughout this program we were told that this would be a huge ceremony that the whole country looks forward to every year. People have new clothes made by the tailor, hair is rebraided, sheeps are bought, drinks are made in vats and everyone who has family in villages go back to the village for a week to celebrate. Whenever I asked anyone about Tabaski, the conversation always started out with “Well, first you kill the mouton…”. Let me clarify, the mouton is a sheep, however the sheep here do not look like the fluffy sheep that we are used to. They actually look like a cross between a sheep and a goat. 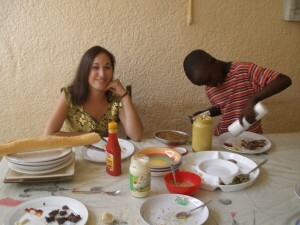 The week before my family prepared for Tabaski by making traditional drinks. My host mom made Bissap, which is a juice made out of hibiscus flowers and lots of sugar! She also made dita, which is made from the dita fruit and is bright green in color. That drink is not as sugary and is one of the most refreshing drinks I have ever tasted. 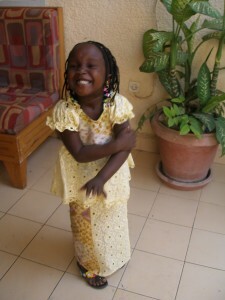 The day of Tabaski rolled around, and I got up early in order to watch the festivities unfold. 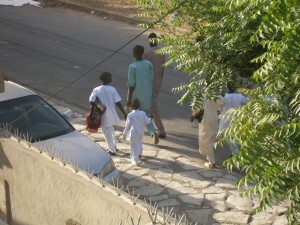 My brother, his sons and all the male relatives dressed up in their new Tabaski boubous for going to morning prayers. At 9 am all the men marched out the door with their prayer rugs in hand to walk to the mosque. It is tradition that everyone prays in the morning, however only the men left in my family to do this. The women all stayed home and got the grills fired up for the mouton to follow. Once the men returned, it was time to sacrifice the moutons! First, a little background on these moutons, most people have at least one, but at our house we had five moutons, one for my brother, my mother, my father, my aunt and the visiting brother-in-law. These moutons had been moved from the stalls outside (you buy moutons in street lots, sort of like Christmas trees) to our terrace . On the day of, after the prayers, we all, including the children, trooped up the stairs to the terrace. The men and boys would hold down the mouton while my brother would say the prayers and cut the throat. 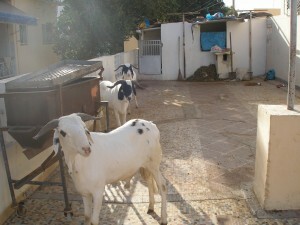 (Note: I am not adding photos of the actual killing of the goats, if you want to see these, just email me!) For me, it was a bit gruesome to watch, but soon I realized the necessity of the act. I have grown up eating meat that came in a package from the supermarket. I was so completely removed from the process that I never connected a live animal to what I was eating. Here there is a yearly reminder that something has to die in order for us to eat meat. Despite the amount of blood and twitching and uncomfortableness I felt at watching five moutons get slaughtered, afterwards I felt much better about being a carnivore. After I seeing the sacrifice I felt that now I could truly eat meat without feeling guilty. As soon as all of the moutons were slaughtered, they began the meat preparation process. 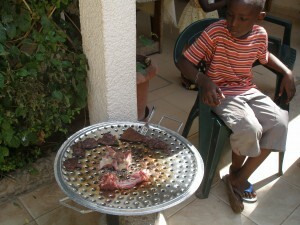 The first part we ate was grilled liver….it was delicious! We set the table with several different types of sauce, and people ate as they could in between meat preparation. Fries were cooking all day, and all the grills of the house had been brought down to be used to grill meat. The family shared the meat with extended family and neighbors and so people came and went in the house throughout the day. Similar to Thanksgiving, people eat all day, wear nicer clothes and give thanks for the day. 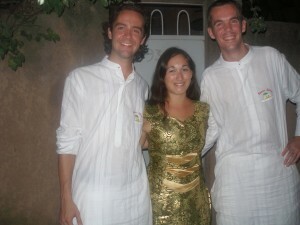 My brother invited two of his new co-workers over, who ended up being from Holland and spoke English. My brother invited us over to a neighbor’s house to have a drink (Note: this was very interesting as Muslims are not supposed to drink alcohol, so right away I knew that we were not going to a Muslim house). We ended up spending most of the day at a family friends house, who happens to be Christian. It wasn’t exactly the way I thought I would spend Tabaski, but we had a great time chatting, drinking and eating! 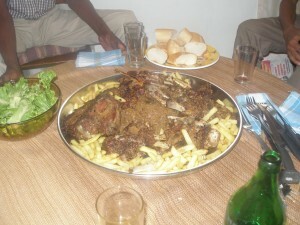 My host family even brought over a huge plate of mouton and fries, yumm! By the end of the day I was exhausted and stuffed to the brim with delicious grilled mouton. I returned home in the evening to find that my entire family had left, and the house was still. I went to sleep very early, thinking that Tabaski was not quite what I expected, but still an excellent holiday of eating, just like Thanksgiving!